I have been hunting deer for 28 years. I never could have guessed what I was about to see on this day. It was one of those mornings I almost didnt go hunting. Thought twice about it and force myself out of bed. I was a little late to my stand, which is only about 100 yards behind my house. It was a perfect morning, cool, crisp air, dry leaves on the ground and a slight breeze in my face. Already getting light, I got myself situated in my stand. I barely had a few moments to enjoy this perfect morning when I heard a deer moving towards me with a hurried pace through the woods. When it reached the clearing, about 50 yards away, I noticed something strange. For a split second it looked like a goat! But no, it was in fact a deer. This buck had a white pattern around his face and neck, stuck out like a sore thumb! I saw a nice rack, not the size I was after but the uniqueness of this deer more than made up for the lack of size. Thinking to myself that I had never seen this deer before, if I let him go I most likely will never see him again. He preceded though the small clearing and headed directly down the trail I was hoping, I had already drawn my bow and there he was less than 20 yards away, broadside. I let the arrow fly! His back legs kicked in the air and off he ran. He went about 50 yards before I heard him crash in the dry leaves. I had about 15 total seconds from when I first saw him until I shot. Not a whole lot of time to process what just happened. I had mixed emotions. I have been watching two bigger bucks that I was holding out for and had my hoped to use my archery buck tag on one of them. I climb down from my stand, found my arrow, covered tip to tip with blood and headed to where I heard him go down. There he was! What a beautiful deer! .and now Im glad I did. 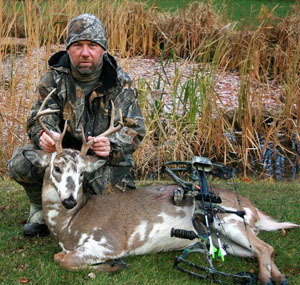 I have shot bigger deer, but nothing as special as this Piebald. 11/11/11 turned out to be a VERY memorable day for me!